Latrobe Mersey River Caravan Park is situated at Bells Parade, Latrobe, near Devonport. Located centrally on the north-west coast of Tasmania, it is ideally located for caravan touring. Offering ensuite-style unisex amenities, laundry, camp kitchen, ensuite family and group cabins, 45 powered and 12 unpowered flat level grassed sites along with quiet, pleasant surrounds, ease of access to the town, and the security offered by live in on-site managers, make this park a restful and pleasant experience. The park is located near pleasant 100-year-old gardens alongside the Mersey River, where at dusk and early morning platypus can be easily observed. Just a short walk puts you in the heart of the shopping precinct. Opposite the park is the Axeman’s Hall of Fame and Bells Parade picnic grounds with under cover BBQ’s and swimming in the Mersey River. You can drive to the Spirit of Tasmania Ferry Terminal in seven minutes, Cradle Mountain Lake St Clair National Park in 90 minutes, the Central Highlands Trout Fishing Lakes in 50 minutes and Hobart in 2.5 hours. 2 Person bunk rooms or 4 person dorm rooms with shared amenities. 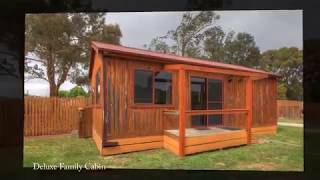 Typically a Park Cabin is a semi-portable dwelling situated within Caravan/Cabin Park. It includes full cooking facilities and private shower/toilet. Fully self contained en suite bathroom, sleeps up to 6 with 2 bunks and a queen bed.